This week, your Frenzied SLPs are bringing you some ideas that they are going to try in the new year to make your frenzied SLP life a little easier. My tip/ idea that I am going to try this year has absolutely nothing to do with my SLP life specifically, but more with getting my family ready for school in the morning. I love my husband dearly, but, lets be honest, most guys just don't get it in terms of how much really goes on behind the scenes before the kids go to school and mom goes to work. I am lucky that he does make sure they eat before they leave (especially important for my son with Type 1 Diabetes), but everything else kind of falls on me. 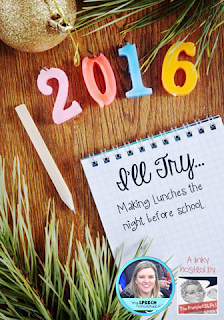 My tip/idea that I am going to try for January is to make everything for lunches the night before. I know this isn't an earth shattering idea or something that nobody has ever thought of before, but it is something that I want to really try and see if it makes my mornings a little easier. I used to work out in the morning, and would really like to get back to that. I think that making lunches the night before may open up a little more time for me in the mornings. 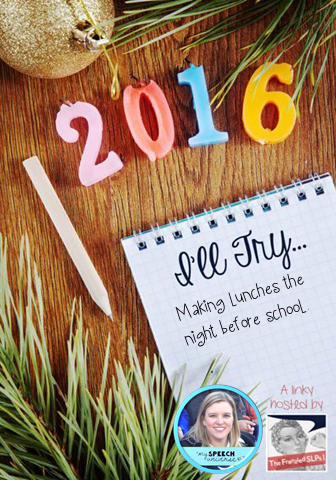 So, for January, I am going to make my boys's lunches as well as my lunch for the next day at night before I go to bed. I am going to stick to it for the four weeks on January, and hopefully, it will become a habit for me, and open up a little time in the mornings. Have a great week back from break! Day one was a success! Why didn't I think of this sooner?!? Excellent plan! Each week I organize a bin for each of my kids in the fridge. It has enough food for lunches for a week. 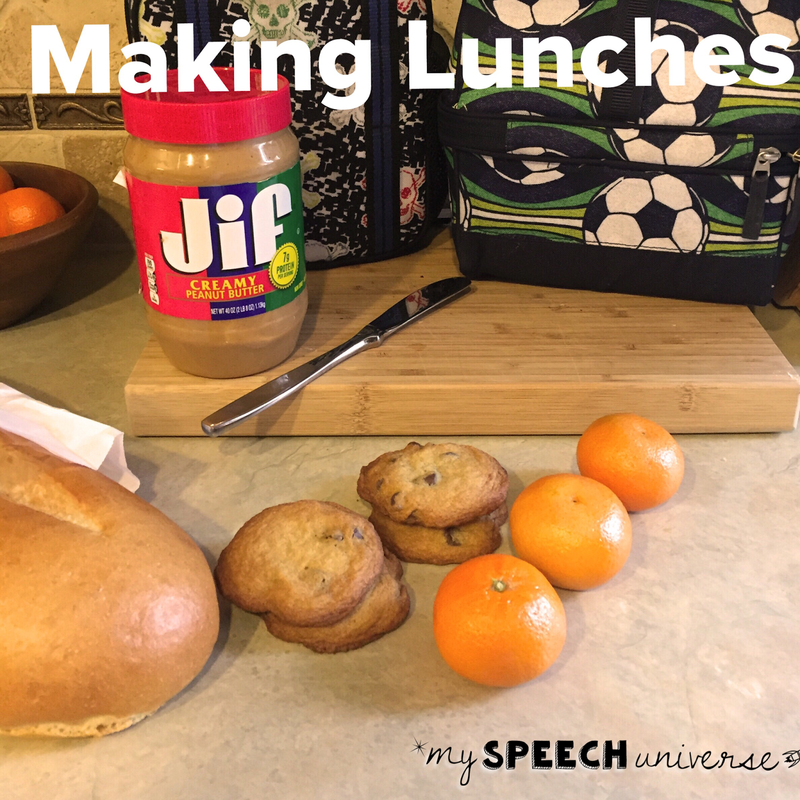 They pull items each morning for their lunch bag. Life is so much simpler without this task on my plate! That is a great idea too! I need to make sure to pack my son's lunch though because I need to count the carbs in everything so the school can give him insulin. Maybe I can just check his before he goes though. Thanks for the idea! I have recently started making my own lunches the night before also! It sounds so silly but saves me 5 minutes every morning! I'm lucky - my husband makes our lunches. Great idea! GREAT plan! I agree that prep the night before is VERY helpful! Great idea! The worst is if for some reason that alarm clock doesn't go off and you are scrambling in less time to get those lunches made! This is why we set out our outfits for the day before and get the backpacks ready too- homework done and their planners signed each evening. It certainly saves a lot of stress during the hurry of the morning. Good luck! 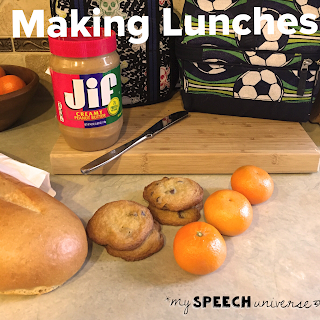 I always made lunches the night before and it really does lessen that morning "SLP-mom frenzy." Kids in Action! Interactive Verb Books!